Hometown: Currently in the City of Angels. Although sometimes it seems that I live in all of my favorite cities at the same time. To live somewhere is a state of mind. One can live in New York but feel as if they are in Paris. Having lived in various cities around the world, I have realized that to live somewhere is your physical presence, you live where your soul and mind are, where you can find yourself, fulfill your potential, and where your soul is tranquil. Education: I graduated from Yerevan State Institute of Fine Arts and Theatre. I am very lucky with the career path I have chosen. My mentors were the great master of stage Khoren Abrahamyan and professor Rafael Jrbashyan. They didn’t teach me. They gave me the experience which they had gained in life and theatre. And I am grateful to them for this. You can’t study our profession. All the -isms and teachings are simply a theory. In our profession you need to observe, accumulate and if you are blessed with the talent of self-expression, communicate your experience from the stage to your audience. Favorite Credits: Probably the latest credit as it is the newest and you are new in it. Past credits are in the past. Only from time to time I recall them with a smile. I don't even remember how I performed. Yes, people discussed those credits and papers published reviews but those are all in the past. May be I am playing one big part and the other parts were just stages and a continuation of one bigger part. I don't know… The best is yet to come and the best credit is still out there for me. Why theater? : Theatre for me is a means of self-expression and communication. Theatre for me is a place for a meeting, a place for a date which I arrange to talk to the audience. Where else would you be able to gather so many people who will come to listen to you, to watch you, empathize with you, live with you and your thoughts in that duration of time. Tell us about My Insane Shakespeare: My Insane Shakespeare is a play which makes you reflect on life. It’s a reflection on where the line between the sane and insane lies. May be the world we live is indeed a madhouse. Who do we call insane? Have we ever pondered who lives in those insane asylums and how they ended up there? What inspired you to write My Insane Shakespeare? : My inspiration is an accumulation of 20 years. I haven't been on the stage for 20 years. It was a conscious decision. The theater I had envisioned didn’t exist in the environment I lived in, and the society didn’t need a theatre. I turned away and lived in my own world. I have been searching, reflecting, collecting, writing, accumulating and patiently waiting for the time of my return. And the time came. I wrote and directed a play, My Insane Shakespeare and decided to stage it at the world's largest solo theatre festival in New York. I also performed in my play. 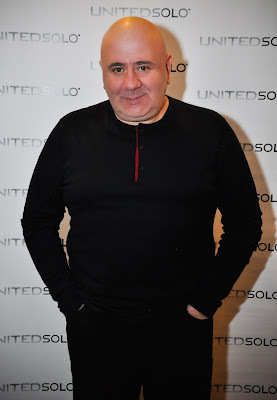 The world premiere took place in New York City, and United Solo became a place for me where I want to return. What kind of theater speaks to you? What or who inspires you as an artist? : The theatre which doesn't give compliments. The theatre which doesn’t lie. The theatre which is intriguing. For me personally, there are two types of theatre – interesting and uninteresting. Life itself inspires me in any of its forms or manifestations. If you could work with anyone you’ve yet to work with, who would it be? : There are many but I will try to narrow the list down - Al Pacino, Kevin Spacey, Meryl Streep, Jack Nicholson, Robert De Niro, Dustin Hoffman, and Nicole Kidman. I have something to offer them, especially in theatre, and I think the audience would see them in a different light. I would also make a movie with all film directors as actors in it, for instance, Francis Ford Coppola, Martin Scorsese, and Woody Allen. And fortunately, I have the movie script. What show have you recommended to your friends? : My Insane Shakespeare by Arthur Elbakyan. It's an interesting one. Who would play you in a movie about yourself and what would it be called? : I think Woody Allen. I'd name the movie “The Eccentric” or “The Eccentric Who Gives Happiness”. If you could go back in time and see any play or musical you missed, what would it be? : I think it would be the first stage production of West Side Story. What’s your biggest guilty pleasure? : Cigars and secret late night visits to the fridge. If you weren’t working in theater, you would be _____? : It's a tough question. I’d probably choose a profession where I would be able to express myself – a writer, an artist. Creating and bringing things to life is my passion. I could probably also be a good gardener. I'd grow flowers and give them to people. What’s up next? : They say if you want to make God laugh tell him your plans. May be I will make a movie and will receive an Oscar for it or will write a book and receive a Nobel Prize. Everything is possible. The most important thing for me is to know myself, why I am in this world. And that's what I am busy doing now.